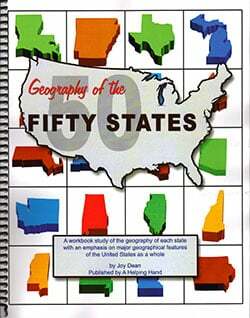 The Geography of the 50 States is a workbook study that also emphasizes the major geographical features of the United States as a whole. 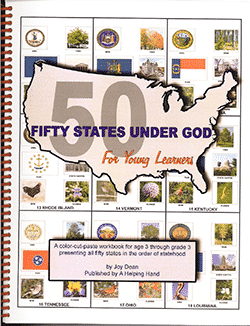 Learn the geography of each state in Geography of the 50 States, a workbook study. Learn interesting information about the geography of each state. Introduces the geographical divisions and features of the nation as a whole. See how geography helped shape history. States are introduced in the order they joined the United States. Study the land regions, geographical features and major cities of each state. 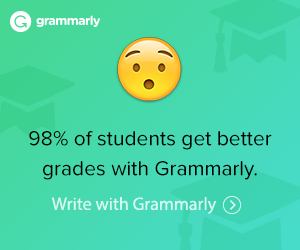 Includes 4 pages per state with 5 overview lessons, 5 tests, answer keys, and lesson schedules. Map activities cover major geographical features such as rivers, mountains, lakes, and major cities of each state. Discover interesting trivia about each state. 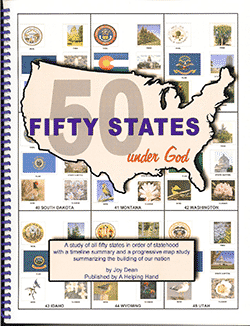 Use by itself or combine with the Fifty States Under God—A 50 States Curriculum Study. Teacher instructions and suggested schedules for one semester or one year. List of Bible verses related to geography to be used for optional Verses Quizzes. An Appendix with tests, overview lessons, and answer keys, all perforated for easy removal before giving the book to the student. 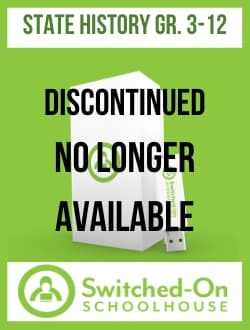 Suggested schedule (30 classes) for use in a homeschool co-op. Download a sample lesson of Geography of the Fifty States. Paperback with plastic lay-flat coil.